HR 4173, the Restoring American Financial Stability Act of 2010 was sent to Conference Committee on June 24, 2010 so the differences in the House version of the bill and the Senate version of the bill could be reconciled. Fortunately, some of the contacts that we made during our Day on the Hill event were appointed to the Committee and they took our concerns with them to the bargaining table. While our goal of having the any language pertaining to seller financing removed was not met, the Conference was successful in increasing the previous limit of one sale per every 36 months to 3 sales per every year. There is certainly still legislation on the table that could impact our industry if passed, but now that we’ve seen some success in our calls to voice our collective concerns we should be reinvigorated in our efforts to protect our own livelihoods. Read everything and download what you need for printing and study. Also, the Student Manual and Instructor Manual for the New Lead Paint regulations can be found below. Please feel free to view the following PDF Documents for additional information regarding Lead Paint regulations. April 21-22, 2010 in Washington DC! Tom & Carolina Zeeb have participated in this excellent event for the past two years and we encourage everyone to join us this year. There are many legislative issues that could easily wipe our business out in a flash. The only way to protect against this is to be involved by letting our voice be heard and letting our elected officials know who we are and how to reach us. This event is a great way to learn about the legislative process and protect our industry. It is also a lot of fun and you will meet many great fellow investors from all across the country. 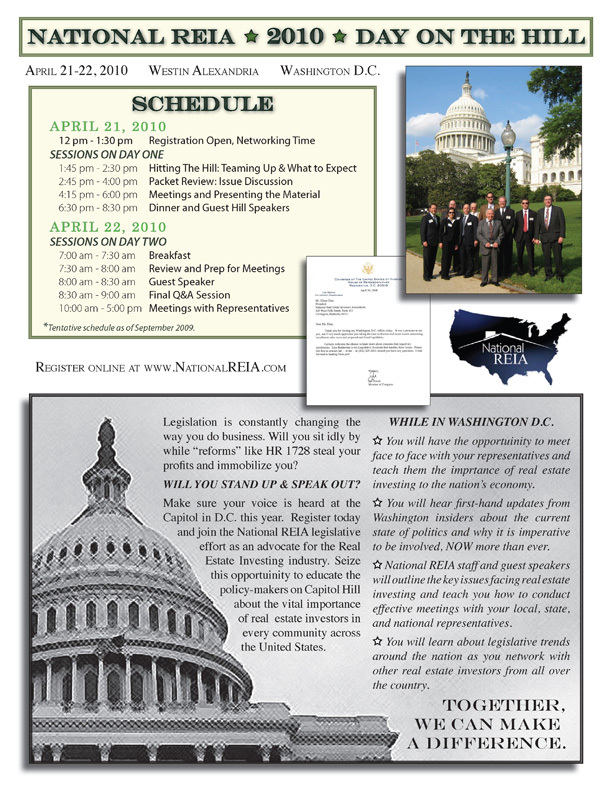 Capital Area REIA Members can sign up for the early bird rate through March 31.